MIT Technology Review and Mass Device covered the recent announcements of Verb Surgical. "When executives from Verb Surgical, a secretive joint venture between Alphabet and Johnson & Johnson, presented at the robotics industry conference RoboBusiness late last month, they made the da Vinci sound lame. Intuitive’s machine, with an average selling price of $1.54 million, is too expensive and bulky, they grumbled. Pablo Garcia Kilroy, Verb’s vice president of research and technology, complained that while da Vinci is an impressive tool, it’s a dumb one that hasn’t widely transformed surgery. He said that while it enables surgeons to perform very delicate movements, it doesn’t assist with the cognitive skills that set the best surgeons apart. Verb claims to be developing a product that will make robotic surgery much more powerful and widely used than the da Vinci has. Garcia didn’t describe that product, and the company has said that a working prototype to be completed this year won’t be publicly unveiled. 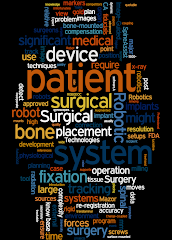 But Garcia laid out the key features Verb thinks a next-generation robotic surgeon needs. 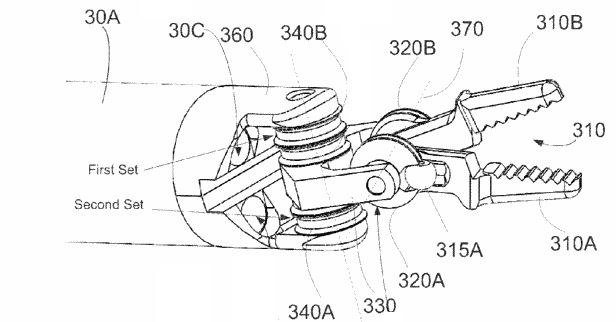 Patents that list him as a co-inventor offer further clues. Google researchers recently got robotics software to learn complex skills more quickly by having multiple robot arms share their experiences (see “Google Builds a Robotic Hive-Mind Kindergarten”). “We see a similar dynamic happening in surgery,” said Garcia. Verb’s robotics technology has been in development for almost four years, though the company only incorporated in August 2015. The joint venture was created by combining a project from Verily, previously known as Google Life Sciences, and Ethicon, a medical-device company owned by Johnson & Johnson. Ethicon had been working on surgical robotics with nonprofit research lab SRI International, and Verb licensed that technology. 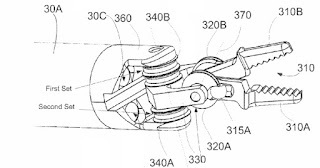 The documents detail systems with more mobile joints than surgical robots on the market, saying that would allow for smaller, more capable robots. They claim this would avoid one problem with existing robots: they can’t reach certain “dead zones” in a patient, because their bulky arms limit maneuverability. SRI declined to elaborate what technologies it has licensed to Verb. Robotic systems that augment a surgeon’s thinking as well as motor control have a better prospect of being used for a wider range of operations and improving the results, says Duvvuri. “This is the kind of approach we need if we are to figure out how to make a good surgeon into a great surgeon and provide better care for the patient,” he says. Garcia of Verb also envisions being able to significantly increase the productivity of surgery by making surgical robots with a degree of automation. One surgeon might be able to supervise multiple theaters, staffed by robots and less-skilled personnel, he said." "Verb Surgical will look to implement a “transformative agenda’ in the field of robotics,” with the goal of “democratizing surgery,” according to Pruden. “The top 5% of surgeons can do things that the other 95% just can’t do, in terms of improving outcomes and procedures. If you travel around the world, it gets worse. “We want to take it to the next level, and if we manage to deliver a system which is built on making better decisions based on advanced analytics, analyzing every decision that was taken by every machine as it’s done,” Fitchet explained, “we bring the opportunity to bring the level of outcomes up as well, meaning every surgeon can get the results of those high operators in say the top 5% of their field." I am keen to find out more about Verb Surgical. Do you know any details of the patent i.e. publication number/patent number etc.? Thanks for sharing nice blog about Robots and device solutions.